A proposed route for the de Soto Expion, based on Charles M. Hudson map of 1997. Hernando de Soto, a Spanish explorer and conquistador led the first European expion deep into the territory of the modern-day southern United States searching for gold, and a passage to China. 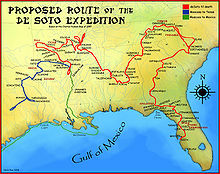 De Sotos group were the first documented Europeans to cross the Mississippi River, on whose banks de Soto died in 1542. (Alonso Álvarez de Pineda was the first European to see the river, in 1519 when he sailed twenty miles up the river from the Gulf of Mexico). A vast undertaking, de Soto's North American expion ranged across parts of the modern states of Florida, Georgia, South Carolina, North Carolina, Alabama, Mississippi, Arkansas, Louisiana, Tennessee, and Texas. Just before they defeated the Spanish Armada, the English began exploring the New World. In 1585 an expion organized by Walter Raleigh established the first English settlement in the New World, on Roanoke Island, North Carolina. The colony failed to prosper, however, and the colonists were retrieved the following year by English supply ships. In 1587, Raleigh again sent out a group of colonists to Roanoke. From this colony, the first recorded European birth in North America, a child named Virginia Dare, was reported. That group of colonists disappeared and is known as the "Lost Colony". Many people theorize that they were either killed or taken in by local tribes. Although slavery had yet to become a major issue, states' rights would surface periodically in the early antebellum period, especially in the South. The election of Federalist member John Adams in the 1796 presidential election came in tandem with escalating tensions with France. In 1798, the XYZ Affair brought these tensions to the fore, and Adams became concerned about French power in America, fearing internal sabotage and malcontent that could be brought on by French agents. In response to these developments and to repeated attacks on Adams and the Federalists by Democratic-Republican publishers, Congress enacted the Alien and Sion Acts. Enforcement of the acts resulted in the jailing of "sious" Democratic-Republican ors throughout the North and South, and prompted the adoption of the Kentucky and Virginia Resolutions of 1798 (authored by Thomas Jefferson and James Madison), by the legislatures of those states. 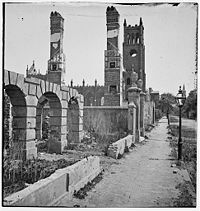 Reconstruction began as soon as the Union Army took control of a state; the start and ending times varied by state, beginning in 1863 and ending in 1877. Slavery ended and the large slave-based plantations were mostly subdivided into tenant or sharecropper farms of 20–40 acres (8.1–16.2 ha). Many white farmers (and some blacks) owned their land. However sharecropping, along with tenant farming, became a dominant form in the cotton South from the 1870s to the 1950s, among both blacks and whites. By the 1960s both had largely disappeared. Sharecropping was a way for very poor farmers to earn a living from land owned by someone else. The landowner provided land, housing, tools and seed, and perhaps a mule, and a local merchant provided food and supplies on cr. At harvest time the sharecropper received a share of the crop (from one-third to one-half, with the landowner taking the rest). The cropper used his share to pay off his debt to the merchant. The system started with blacks when large plantations were subdivided. By the 1880s white farmers also became sharecroppers. The system was distinct from that of the tenant farmer, who rented the land, provided his own tools and mule, and received half the crop. Landowners provided more supervision to sharecroppers, and less or none to tenant farmers. There was little cash in circulation, since most farmers operated on cr accounts from local merchants, and paid off their debts at cotton harvest time in the fall. Although there were small country churches everywhere, there were only a few dilapidated schools; high schools were available in the cities, which were few in number, but were hard to find in most rural areas. All the Southern high schools combined graduated 66,000 students in 1928. The school terms were shorter in the South, and total spending per student was much lower. Nationwide, the students in elementary and secondary schools attended 140 days of school in 1928, compared to 123 days for white children in the South and 95 for blacks. The national average in 1928 for school expenditures was $70,700 for every 1,000 children aged 5–17. Only Florida reached that level; seven of the eleven Southern states spent under $31,000 per 1000 children. Conditions were marginally better in newer areas, especially in Texas and central Florida, with the deepest poverty in South Carolina, Louisiana, Mississippi, and Arkansas. Hookworm and other diseases sapped the vitality of a large fraction of Southerners. ^ Dennis, Michael (2009). The New Economy and the Modern South. Gainesville: University Press of Florida. ISBN 978-0-8130-3291-7.